Keywords: cultivar: Dionaea muscipula ‘Bohemian Garnet’, Nepenthes talangensis × maxima ‘Lady Pauline’. This plant was obtained from an F2 cross between an all red clone (Dionaea ‘Royal Red’) and a more typically colored Dionaea ‘Sawtooth’ plant in 2000. It does not demonstrate any new mutation in general leaf form, but it does have new attributes which distinguish it from other, previously existing Dionaea cultivars. Establishing this plant name as a new cultivar will help keep proper order in the wide assortment of Dionaea muscipula cultivars already registered. All-red coloration of plants, similar to Dionaea ‘Akai Ryu’. Marginal trichomes are reduced and divided to numerous toothlets similar to Dionaea ‘Sawtooth’. 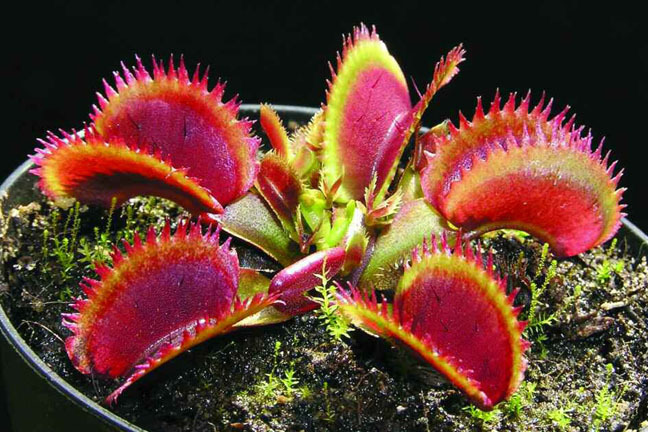 Note that the trichomes on Dionaea ‘Red Piranha’ are dentate, but not sawtooth. Adult plants are about 4-6 cm in diameter, only about half the size of most Dionaea (including Dionaea ‘Sawtooth’). Enormous proliferation. One individual is able to produce 10-30 or more offshoots during a single growth season. I coined the cultivar name, ‘Bohemian Garnet’, on 17 November 2006. This name reflects the all-red color of plants, their small jewel-like size, and fact that they are usually seen in large number — such as several garnets are often used in a single piece of jewelry. Finally, the name also honors the Czech Republic (Bohemia), the country of origin for this cultivar. In Czech, the name can be written Dionaea ‘Ceský Granát’. Cultivation of Dionaea ‘Bohemian Garnet’ is standard, no increased sensitivity to fungi or any other pests was observed. I recommend the continual removing of its numerous offshoots to obtain as large a plant as possible. These offshoots root well even though they are very small. Dionaea ‘Bohemian Garnet’ must be propagated vegetatively to maintain all the described characters of this unique clone. Propagation via seeds is not necessary because of extreme proliferation. Because of horticultural trade that occurred before the registration of this cultivar name, specimens of this cultivar are already in a large number of European collections. Therefore I ask all growers who obtained their plants from my collection to change the labels of any plants called “red sawtooth” to the new established name Dionaea ‘Bohemian Garnet’. Contact me if you want me to validate the identity of your plant, if you are unsure if it is Dionaea ‘Bohemian Garnet’. Back Cover: The new cultivar Dionaea ‘Bohemian Garnet’. Photograph by Miroslav Srba. This outstanding artificial hybrid between N. talangensis and N. maxima originates from a sterile culture I obtained 1998 from Thomas Alt, Germany. It is believed that the cross was made either by him or by one of his close associates in Germany. For a number of years, plants of this hybrid parentage, all of similar overall appearance and morphology were being circulated erroneously as “N. bongso × maxima.” One of the reasons for the name confusion was probably due to the fact that at that time, N. talangensis had not yet been formally described. In general morphology as well as pitcher shape this plant is intermediate between the parent species. The lower pitchers are similar to N. maxima in coloration, being richly speckled in dark purple, with a wide dark purple peristome up to 3 cm across. 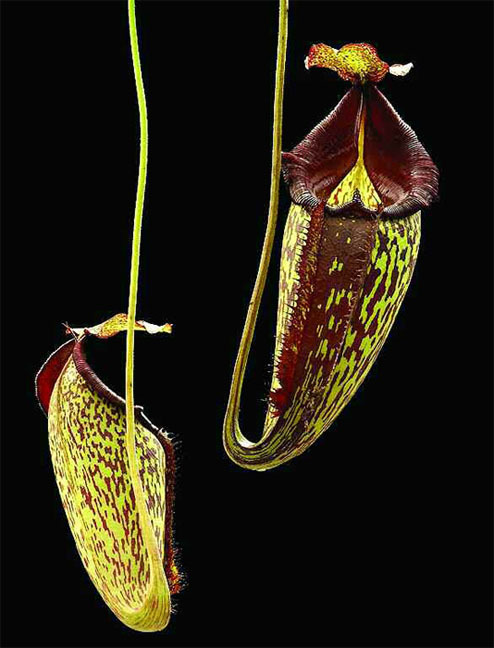 The pitchers are distinctively shorter and wider than those of N. maxima, reaching dimensions of 14 cm by 8 cm. They are widest just beneath the peristome. Also, the pitcher mouth is more horizontal and round than that of N. maxima. The upper pitchers are similar to the lower pitchers in overall size, but are more infundibular (funnelshaped) and are lighter in coloration, being translucent pale cream with red stripes and red peristome. The leaf blades are linear-lanceolate, obtuse at the base. The leaf blade apex is obtuse, occasionally somewhat emarginate in mature specimens. In order to preserve the characteristics of this plant, it should be propagated vegetatively. This plant is named in honour of Dame Pauline Norma Harris D.L., mother of Martin Harris, Commercial Director of Carpetright plc, who has very generously sponsored Borneo Exotics for the Chelsea Flower Show in 2006. Martin Harris coined the name on 15 March, 2006. 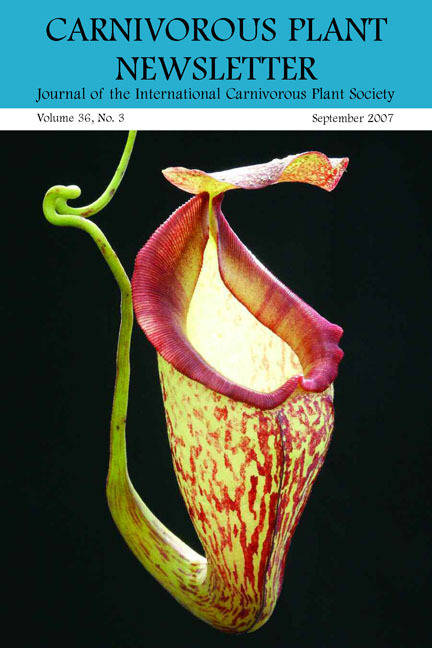 Front Cover: Nepenthes ‘Lady Pauline,’ upper pitcher. Photograph courtesy of Borneo Exotics. Figure 1: Nepenthes ‘Lady Pauline’ lower pitchers. Photograph courtesy of Borneo Exotics.